This u/s pic was done at my 20 week appt. It shows twin a with her knee in her sisters face. Poor thing, I hope this isn't showing what the future holds. Lol. Oh, it is just the beginnng! I am in my 18th week with twins and three more at home. Let me tell you! I always hoped my children will get along! Biggest reason for an elevated blood pressure this pregnancy? Trying to stop the fighting of the other three! However, it is wonderful that usually five minutes after any fight, they get along beautifully! Plus,when my second and third child end up falling asleep together (they are one year apart), one always has something in the other's face. I have decided it is a comfort thing that the other one is near! That is a great pic! 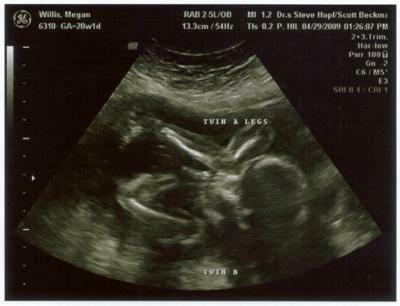 At my ultrasound, they did 3-D at the end and one of them yawned and as soon as they did, they got a foot in the face from the other one. I'm sure they are kicking and poking each other all the time, especially as they get bigger! I know what you mean about wanting to be done already. I do want them to stay in as long as they can to make sure they are developed enough, but I can't wait to see them and what they look like and their personalities! :) Having twins is a lot of fun! Take care of yourself! HEY THERE!! WHEN I WENT TO ONE OF OUR MANY ULTRASOUNDS I HAD A BOY/GIRL TWINS, IT CLEARLY SHOWED THE GIRL(EZRA) KICKED HER BROTHER(MALACHI) BETWEEN THE LEGS AND PUNCHED HIM IN HIS FACE :) MY DR SAID FROM THE BEGINNING SHE WAS THE FIESTY ONE!! AND TODAY THERE A HEALTHY 6 MTHS OLD AND SHE STILL TRIES TO SCRATCH HER TWIN BROTHER AND TRIES TO GET HER HANDS ON HIM. WHEN I LAY THEM SIDE BY SIDE SHE KICKS HIM AND TRIES TO GET HER CLAWS ON HIS FACE. THERE VERY CUTE, I JUST HOPE SHE DOES'NT CON'T ON WITH IT WHEN SHE GROWS OLDER AND KNOWS HOW TO USE HER FISTS :D CONGRATULATIONS ON YOUR TWINS IT TRULY IS SUCH A VERY SPECIAL BLESSING FROM THE MAN UP ABOVE! AND BEST WISHES TO YOU AND YOUR GROWING FAMILY! !